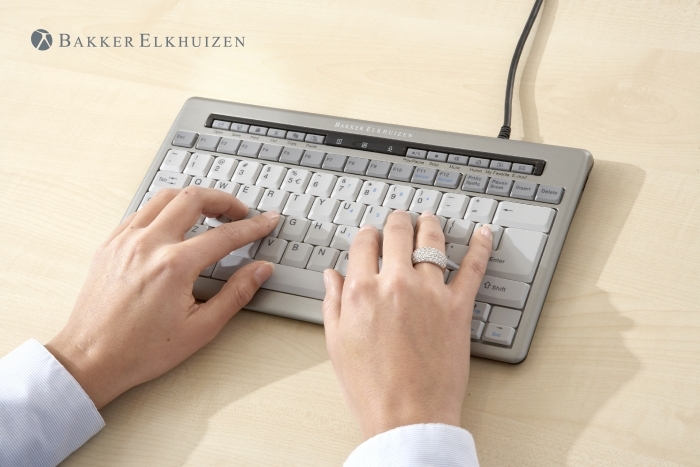 The BakkerElkhuizen S-Board 840 USB Compact Keyboard is designed to offer greater comfort than a standard keyboard, writes Tayla Ansell. In particular, the removal of the numeric keypad found on standard keyboards enables a mouse to be placed closer to the user, reducing strain on shoulder and forearm. Even though my job involves a lot of typing, I’ve never given much thought to the keyboard I use. The offer of a BakkerElkhuizen S-Board 840 to review was a good opportunity to see if I was missing out. I very rarely use the number pad on my standard keyboard, and didn’t miss it on the S-Board 840. And, while I wasn’t aware that I had been reaching for my mouse before, I did find that having a more centrally positioned mouse was more comfortable. I’m sure this arrangement would greatly benefit anyone with a shoulder injury or RSI. For those, who require a number pad for data entry, there is an optional numeric keyboard. The keys are noisier than my usual keyboard, with a more tactile feel (which I now know comes from the use of a scissor-switch mechanism instead of the membrane key switches found in most standard computer keyboards). I liked the feel of the keys and even found their ‘clickyness’ quite satisfying. Unlike my usual keyboard, which has black keycaps and white letters, the S-Board 840 has dark letters on a light background. This makes them easier to read, but is probably of little value to a touch typist. Because it’s so compact, thin (just 2cm thick) and lightweight (480g), the S-Board 840 fits easily in a laptop bag, making it ideal for mobile workers. I particularly like the keyboard’s two USB ports, as I never seem to have enough on my PC. From my vantage point, I can recommend the S-Board 840 unreservedly, though I should point out that colleagues have commented on the loud typing noise.